On Opening Night of the National Symphony Orchestra's 2010-2011 season, I wrote that the largely stale programming eventually would include one masterwork "worthy of international pilgrimage" for which I would "sit rapt at all three performances." As of tonight: one down, one to go, and an excuse for that one in the middle: I need to hear the composer's other magnum opus somewhere else. Thankfully, none of this requires international travel; a cab ride will do. The object of this over-the-top affection is Olivier Messiaen's Turangalîla-Symphonie. It has been something of an obsession for me over the past two years, because of a relatively minor magnum opus of my own called Financial Capital that aims to set the entire 75-minute musical composition to landscape/time-lapse cinematography. I'm about 30 minutes in, so at this rate I'll be rolling credits in nearly a decade. People are fond of saying that the work polarizes audiences. Well, a few things about that. It runs 80 minutes (or about 75 if anyone follows the score's tempi, ahem), so it tests your patience. Its lyrical expanse is so ambitious that it either sweeps you away or gets you stuck in the sap. It uses an early synthesizer called the ondes Martenot, rather like a theremin, that sounds timbre-rich to some and sci-fi-campy to others ("Greetings, Earthlings, we come in peace!"). And for those who require genre categories, this work defies them all. It is at once lyrical poetry and chromatic mayhem. Under Christoph Eschenbach's baton, things go a bit slow and studied; yet the interpretive trick to this work (I believe) has always been to temper its dramatic heft with the spirit that always belied the piece: love of nature. A well known part of Messiaen's biography is that he daily cherished walks in the forest, for listening to bird song as his muse for the day's composing. (Björk has mentioned Messiaen as her archetype; I quite agree, thinking of Selma in Lars von Trier's brilliant Dancer in the Dark; or, that Messiaen's birds are Björk's cracking icebergs.) These nature rhythms need to inform any performance of the Turangalîla-Symphonie, with open tempi even nearing syncopation, especially during the bird calls that occur between piano and orchestra that are structured as loose antiphony. Similarly, there are critical accelerando passages in the second movement that Eschenbach seemed to overlook. All of this goes well, and Horowitz's presenting temperament finely matches the intellectual breadth of the forthcoming work (he resists promising roses), but this is naturally a perceived necessity of compromise: that audiences need to be coddled before going under the knife. Leonard Slatkin did it too (speaking from the podium for which he was so well known), and I do have the memory from that first NSO performance -- and others I've seen elsewhere -- of seeing the audience trickle away as the running time grows unbearable. I saw some of that tonight, but not much, which may or may not be a good thing depending upon the baseline question whether averse patrons lately process this stuff for real, or wait it out loathesome. Because the Turangalîla-Symphonie is basically a duo concerto for piano, ondes Martenot and orchestra, it requires virtuosic performances, and both soloists deliver. As an afterthought, though, something really quite horrible happens -- and I'm loathe to mention it because the mere opportunity to hear one competent performance of this work is almost above reproach. But the man in charge bears all responsibility; and what happens is this: the damn organ is too loud. 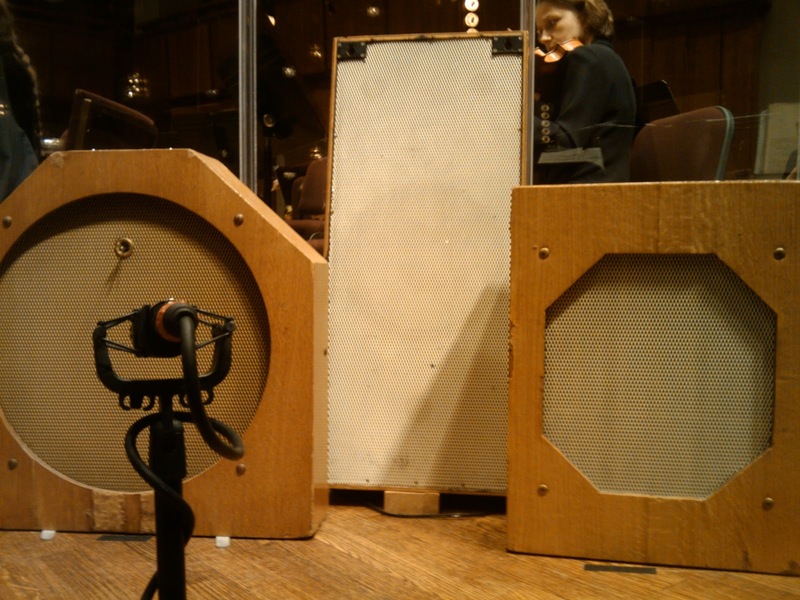 Which is to say, the conductor has balanced volume from his position at the podium, but the speakers for the ondes Martenot (pictured above) send out unfiltered, unenveloped, pure sine waves straight into the audience's ears. Although this is not something that Eschenbach could have heard from behind the speakers, it is an obvious concern and he should have known better. I can only imagine how much worse this would have been for the NSO's older demographic, who could be seen variously lurching for their hearing aids to turn down the pain. In the definitive recording of this work , by contrast, Kent Nagano turns down the ondes Martenot to its proper volume, where its scored role to largely double other instruments simply finds its place. Remaining performances of the Turangalîla-Symphonie are Friday and Saturday, March 11 and 12. Using this special link, you can receive $20.11 tickets to seats in the Orchestra Premium and Orchestra Prime sections that are otherwise as much as $78. You can also mention Promo Code 58728 over the phone or at the box office to this same effect.